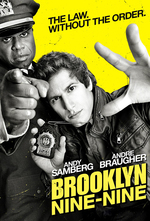 When a hard-boiled former undercover detective (special guest star Jason Mantzoukas) rejoins the Nine-Nine, Jake steps up to ease him back into a normal routine. Meanwhile, Gina tries to apply her trademark pizzazz to an informational video for the precinct, and Boyle must appease the janitorial boss (guest star Kate Flannery) after making an nigh-uncleanable mess of the break room. Last week, Netflix released the official trailer for the long-in-development Pee-wee's Big Holiday, starring Paul Reubens as the titular man-child. Sharp-eyed watchers will spot B99's own Stephanie Beatriz (beginning at 1:18) as one of a trio of Russ Meyeresque bank robbers who enlist Pee-wee as an unwitting wheelman. Faster, pussycat! Jason Mantzoukas needs to play this character in short bursts on every TV show forever. Here's Mantzoukas running through his "many scumbag onscreen roles." Adrian Pimento is a cross between Rick from Walking Dead (especially when bathed in blood and rolling his eyes) and Joe Manganiello. My dvr chopped off the very end of the episode again - what happened after the SWAT team breaks open the door? JAKE: NYPD! You're under arrest! You are Rosa Diaz and I claim my five .. you know what, never mind. I choose to believe that the Raffi character was part of his time undercover. Jason Mantzoukas and Kate Flannery guesting in the same episode? It's like they made it special for me.